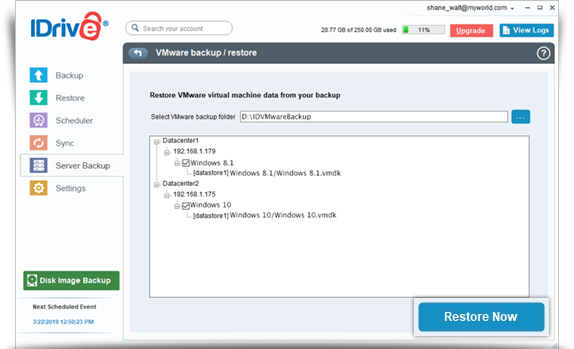 Does IDrive support incremental backups for VMware virtual machines? Which ports are required by the IDrive application to perform backup and restore operations? How do I test the VMware connectivity to port 902? How can I backup my VMware virtual machine(s)? 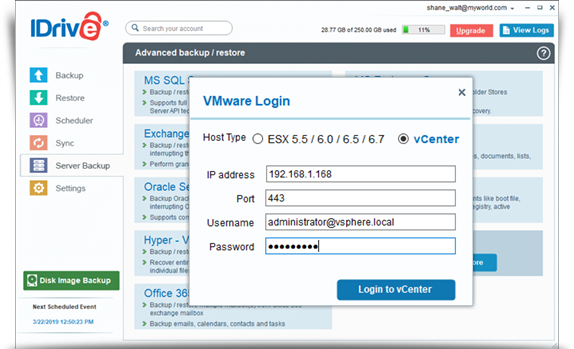 How do I view and backup virtual machines from vCenter? Can I backup VMware virtual machines to a network mapped drive or NAS drive? What are the system requirements for IDrive VMware backup? Do I need to turn off or shutdown the Virtual machine(s) in VMware manager to take a backup? 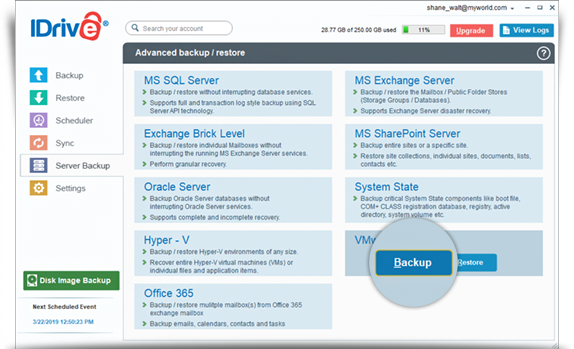 How secure is data transfer during backup/restore using IDrive VMware backup? How do I restore virtual machine(s) to the VMware Server? Can I restore VMware virtual machines from a network mapped drive or NAS drive? Is there a need for an additional/external storage volume for VMware backup? Can I attach a VMDK file from IDrive VMware Backup to a different VMware server? Can I upload the backed up VMDK file using 'vsphere client/web interface' to attach to VWware ESXi? Yes, after the initial full backup subsequent backups with IDrive are incremental. To perform incremental backup, enable Change Block Tracking (CBT). Right-click the virtual machine and click 'Edit Settings'. Click 'General' under the 'Advanced' section, and then click 'Configuration Parameters'. The Configuration Parameters dialog box appears. Add the ctkEnabled parameter, and then set its value to true. Click 'Add Row', add scsi0:0.ctkEnabled, and set its value to true. Note: scsi0:0 in scsi0:0.ctkEnabled indicates the SCSI device assigned to the hard disk, which is added to the virtual machine. Every hard disk added to the virtual machine is given a SCSI device similar to scsi0:0, scsi0:1, or scsi 1:1. The CBT option is either enabled or disabled on each disk. Ports 443 and 902 should be open and accessible on the source host to perform backup and restore operations. Select the 'ESX 5.5/ 6.0 / 6.5 / 6.7' radio button. Enter valid credentials and click 'Login to ESX'. Select the virtual machine(s) from the list and specify a temporary path for the local backup. Click 'Schedule Now'. The Schedule backup screen appears where you can schedule the backup for any future day and time or perform an immediate backup of the selected virtual machine(s). 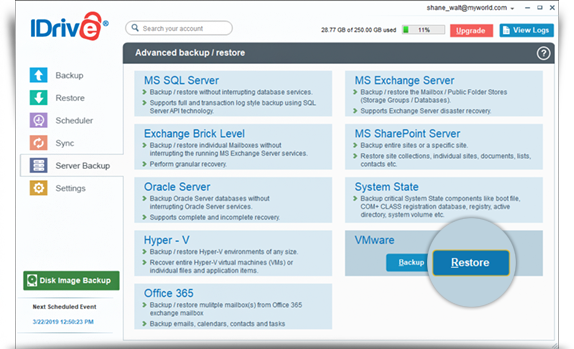 In the VMware Backup section, click Backup. The VMware login screen appears. Select the virtual machine(s) from the list and specify the temporary path for the local backup. Click 'Schedule Now'. The Schedule backup screen is displayed where you can schedule the backup for any future day and time or perform an immediate backup of the selected virtual machines. Yes, you can backup VMware virtual machines to a network mapped drive or NAS drive. While choosing a local backup path, select the network mapped drive / NAS drive and provide the necessary authentication. 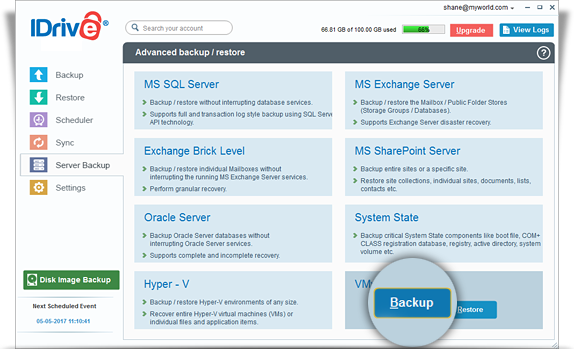 In the VMware Backup section, click ‘Backup’. The VMware login screen appears. Enter valid credentials and click ‘Login to ESX’. Select the virtual machine(s) from the list. Select the network mapped drive / NAS drive as the location for creating the disk image and click 'Schedule Now'. Enter your username and password to authenticate network mapped drive / NAS drive and click ‘Authenticate’. The Schedule backup screen appears where you can schedule the backup for any future day and time or perform an immediate backup of the selected virtual machine(s). No, you do not have to shut down your active virtual machine(s) to perform a backup. IDrive enables you to backup virtual machine(s) in their running state. IDrive uses military grade 256-bit AES encryption to encrypt all data transferred during a backup / restore operation using IDrive VMware Backup. Log in to the IDrive application and click the 'Restore' tab. Locate and select the 'IDVMwareBackup' folder in your IDrive account. 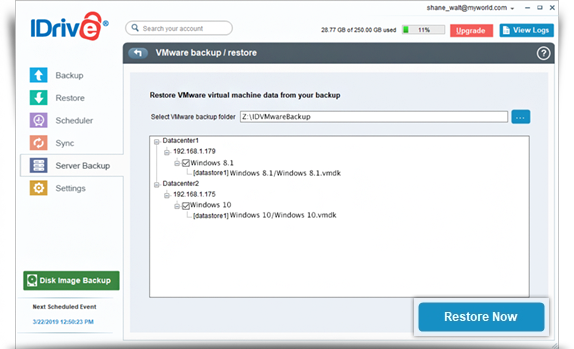 Click 'Restore Now' to restore the 'IDVMwareBackup' folder to the local computer. Once the 'IDVMwareBackup' folder has been successfully restored, click the 'Server Backup' tab. In the VMware section, click 'Restore'. The VMware login screen appears. Browse and select the 'IDVMwareBackup' folder (restored earlier from your IDrive account). Select the virtual machine(s) you want to restore to your VMware server. 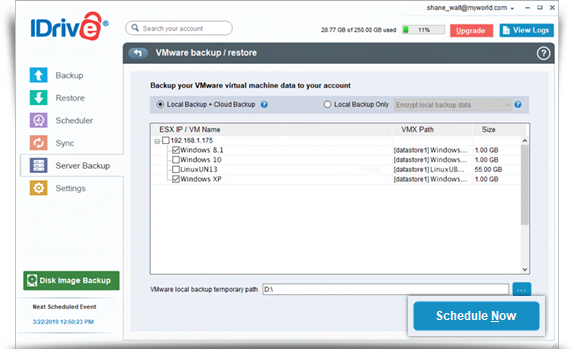 Click 'Restore Now' to restore the virtual machine(s) to the VMware server. Yes, IDrive lets you restore VMware virtual machines from a local path, including network mapped and NAS drives. Go to the 'Server Backup' tab of IDrive application. Browse and select the 'IDVMwareBackup' folder saved in your network mapped / NAS drive. A popup reminder will inform you to power off the virtual machine before continuing with the restore. Click 'Continue'. Provide network drive credentials and click 'Authenticate'. On successful completion of the restore, a restore summary will be displayed. No. However, do ensure that the temporary location that you select while scheduling the VMware backup has sufficient disk space to hold the selected items, during the backup process. Yes, you can attach a VMDK file from IDrive VMware backup to a different VMware server. Yes, you can upload the backed up VMDK file to ESXi using vsphere client. However, you need to convert the monolithic sparse VMDK file to thin disk after uploading, using 'vmkfstools', to attach to VMware. vmkfstools - i "Source vmdk path" "destination vmdk path after conversion"
For example: vmkfstools -i /vmfs/volumes/datastore1/centos/centos.vmdk" "/vmfs/volumes/datastore1/centos/centosafterconvert.vmdk"